In the second instalment of our meet the committee series of blogs, to try and help club members get to know the committee and the role they perform, this weeks committee member in the hot seat is Honorary President and Life Member, Ian Phillips. 3. What is best part of doing that role, and what is worst part – As Fixture Secretary It is a role that keeps you at the heart of the club, and is usually very satisfying, but best of all are the friendships you develop with your counterpart in the Ladies section. Over the years Pooky, Rachel Barson and Gabby have all been brilliant, and kept me going when the worst happens to any fixture secretary – frost and snow (oh and the addition of a new 6th team after the season has started meaning we have to find a new pitch!). When I retired over 10 years ago, I thought it was time to give a bit back to Adel for taking me on in my 40’s, even though they only did it as long as I became 6th team captain! So when the Fixture Secretary role became available I took it on. 4. Previous clubs and When joined Adel – I started playing hockey when I was 14, and arrived at Adel 30 years ago after playing for British Rail Swindon, Cheltenham, Leeds Corinthians, Leeds Saints Mixed and Bardsey [which I must admit was a mistake!]. I also play for Wales over 70s at the moment which means I travel the globe representing my country at a time when I never thought I would ever pull on an international jersey. 5. Best ever moment in an Adel shirt – My best moment hockey wise for Adel was actually the season when I was 50. I jokingly said at the start of the season 50 goals in my 50th year. I did score a few goals at the time, never more than a metre away, hence my nickname ‘Sniffer’, but 50 was rather a lot! When Christmas arrived I had 25 in the bag and it all looked good and how could I fail? By the end of the season 28. Ah well! 6. Trophies won at Adel (and elsewhere for hockey related activity) – mens top scorer a few times! 7. Away from Adel whats the day job – now retired but I used to be a school teacher so can relate well to the current 5th team with lots of youngsters starting out in theiersenior hockey careers with Adel. So I am fortunate that I can now spend my time on my hobbies and this largely revolves around the international masters circuit competing against England, Holland, Australia and Scotland! 8. What do you like best at Adel as a club – I have to thank Adel for letting me join in my early 40’s. I have had a great 30+ years with the club, and I hope to continue for a few more years ‘sniffing’ the odd goal. 9. If you had a dream dinner party, which three other club members would you invite – I would have to invite David Margerison so I can recount the time I scored for the Welsh Masters against David’s Scottish Masters and then the ladies fixture secretary at the time and finally Max Holley who helps set up most of my goals now and does all my running on the pitch for me. 11. Anything else! 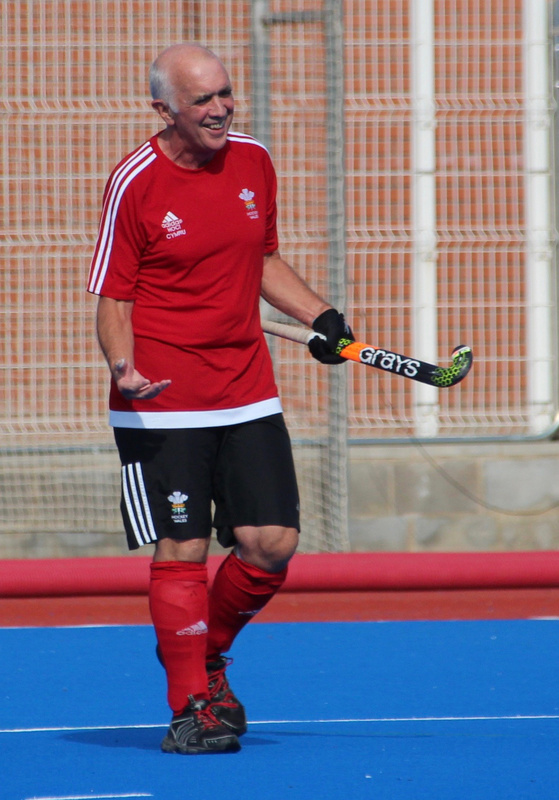 – My proudest hockey moments were being selected for Wales Grand masters [O65’s] four years ago, and then Wales Great Grand Masters [070’s] this year. Scoring against Scotland in the World Cup in Barcelona this summer was definitely one of those unforgettable moments, and it was from more than a metre away, which took the Scots by complete surprise!